Oh my gosh!!!! I love the Umbrella's my sister would die! 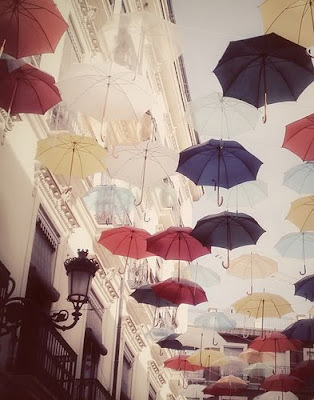 Her blog is titled Under the Umbrella :) It's super fun! She has an amazing picture for it! I never thought of an umbrella as an accessory. I wish I had me some vaulted ceilings to decorate now! It NEVER rains here and I love the rain, especially when I can use an umbrella. I only regular rainy days were this magical! I love the last picture with the red color accent! That first photos is great but they're all so beautiful. who knew umbrellas could make such a statement. Wow, Christina! I loved this post! Great finds! Thanks for sharing this with us--today fits just wonderfully considering the huge thunderstorm we had last night and the monstrous hail storm this morning! as a writer, its good to take a day off. your site is juicy and delicious! 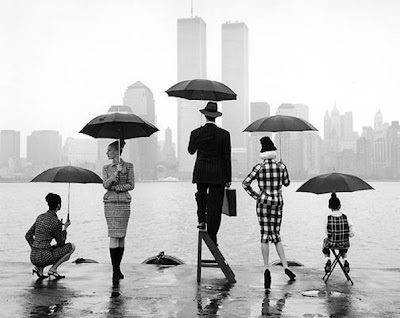 I always love anything with umbrellas. They are just so cute. Check out the video for Brandi Carlisle's "What Can I Say" from a few years ago; it's so cool. I used to use it as a prompt in my class. It's raining here too! My room is right by a skylight and it's LOUD. I like the rain when I don't have to go outside. Please send some of those artistic umbrellas my way. It's raining cats and dogs right now in DC! And I love that rib and corn bake! I love to doodle umbrellas, especially when I'm bored on the phone. They are so interesting and pretty, I wonder why? I love the rain! And I love these pictures....especially the first and the last ones. Ohhhhhh, that last image is SO romantic!